Mission of WARR is to provide a worldwide athletic event, promote travel within the airline industry and foster friendships and coordination between airlines. WARR is a professionally run, volunteer-driven, four-day event put on by airline members offering to host in their home city. Now entering its 37th year in 2018, with over 1,500 participants from 60+ airlines, the World Airline Road Race is one of the largest annual airline athletic events in the world. Merlane would love to get some recruiting of folks and retirees welcome to join the Jazz or AC team. Volunteers needed race day morning which is Saturday, September 29. 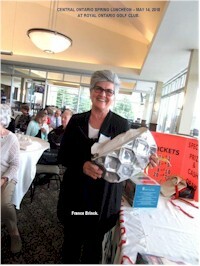 Click Here to contact Merlane if you are interested in volunteering. Mary Ellis, who played a vital part in defeating Germany in the battle for Britain’s skies during World War II, passed away on July 24, 2018, at 101 years of age. Ellis, one of the last surviving female aviators from the United Kingdom’s wartime forces, delivered fighters and bombers in her job with the Air Transport Auxiliary (ATA), which called up women in 1941 due to a shortage of male pilots, many of whom died as the nation scrambled to intercept and shoot down Nazi planes. 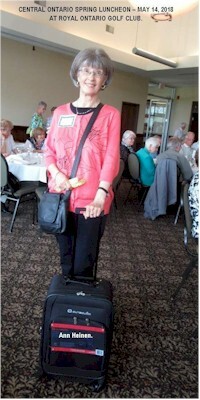 Recently, Mary recalled her first encounter with the plane. “When I went to collect my first Spitfire,” she told Forces.net, “the man helping me with my parachute asked, ‘How many of these have you flown before?’ And I said, ‘None, this is the first one,’ and he nearly fell off the airplane." This photo of Mary Ellis (nee Wilkins), posing at Biggin Hill Aerodrome, UK on August 18, 2017. Harold Rex Terpening passed away on July 15, 2018, at the age of 104 and was a true Pioneer in aviation. Born July 23, 1913, he began an interesting and rewarding career in aviation at a young age in Fort McMurray, AB. During his career, he travelled widely and was deeply involved in the development of aviation in the Canadian North. After retiring from CP Air in 1978, Rex and his wife Trudie spent many summers at the cabin on Tagish Lake in the Yukon. 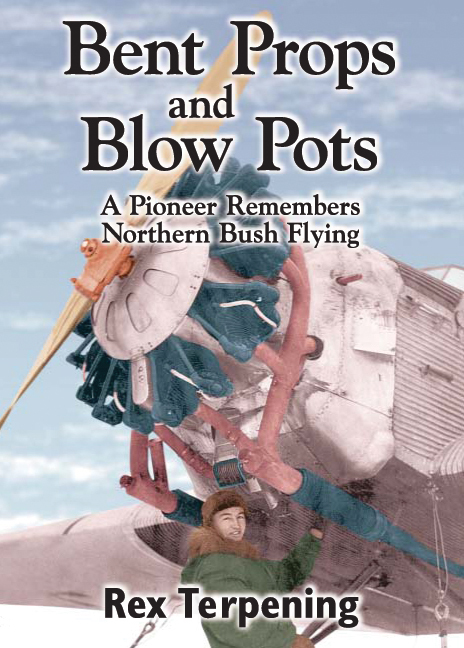 He authored a well-received book, Bent Props and Blow Pots which recounted many of his experiences during the early years of Canadian aviation. Rex was rewarded with a number of honours including induction into Canada’s Aviation Hall of Fame, and recently had a building named after him in Fort McMurray. 7778 - 152nd St., Surrey, B.C. Aeroplan to launch charter airline after Air Canada partnership ends. Aeroplan aims to get into the airline business by offering charter flights to its most popular destinations as the loyalty program prepares for the end of its exclusive partnership with Air Canada in 2020. Air Canada to slow growth rate after a 2Q net loss. Air Canada is “extensively” studying its capacity projections for late 2018/2019 and has confirmed it will reduce its growth rate, but has not finalized the timing or extent of its changes, top executives said. Star Alliance voted Best Alliance at Skytrax World Airline Awards again. Star Alliance was voted Best Airline Alliance at the Skytrax World Airline Awards for the third year running, with the Alliance’s Los Angeles Lounge retaining the Best Airline Alliance Lounge Award for the fourth year in a row. The Star Alliance network was established in 1997 as the first truly global airline alliance to offer worldwide reach, recognition and seamless service to the international travellers. 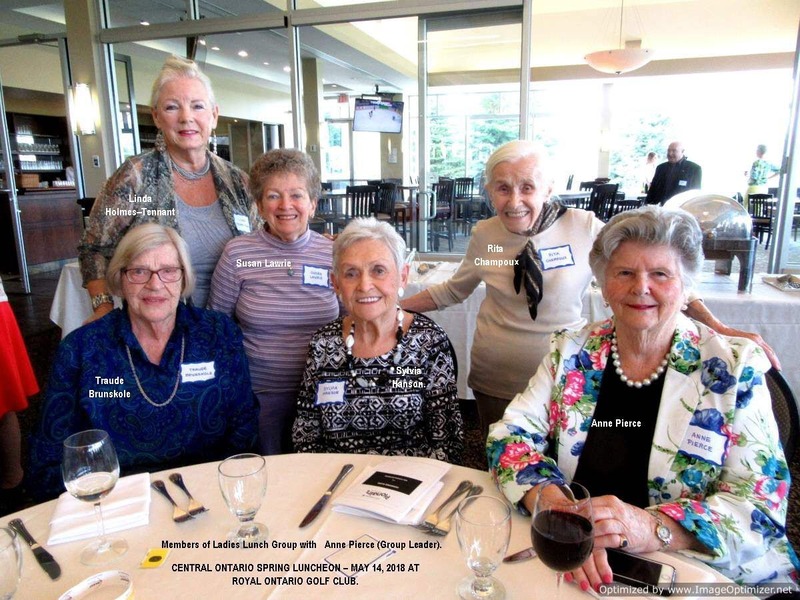 Shirlee Schacter sent us this account of the Air Canada Pionairs Central Ontario Spring Luncheon held on May 14, 2018 at the Royal Ontario Golf Club. Always a popular event; 124 members registered to attend. The complimentary wine tasting (a glass of red and white wine for each Pionair) arranged by Event Chair, Valdy Prieditis, was once again a big hit. The Door Prize Table saw a prize go to each table (16). 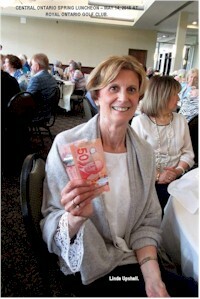 In addition, there was a Special Prize Table and a number of Cash Draws. A “first” this year also saw 4 “double winners” – those lucky Pionairs who won the Door Prize at their table and also won a gift from the special Prize Table or one of the Cash Draw prizes!!! 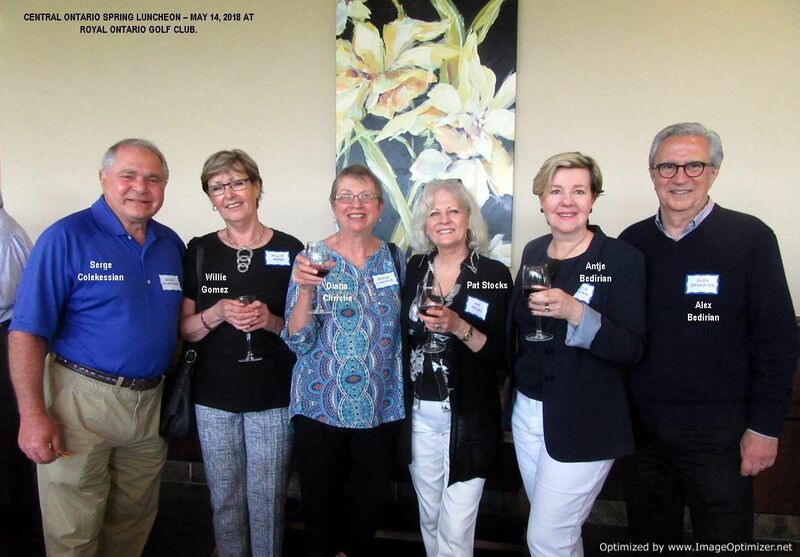 Below are the 4 double winners, Linda Holmes-Tennant, Ann Heinen, Linda Upshall and France Brinck. 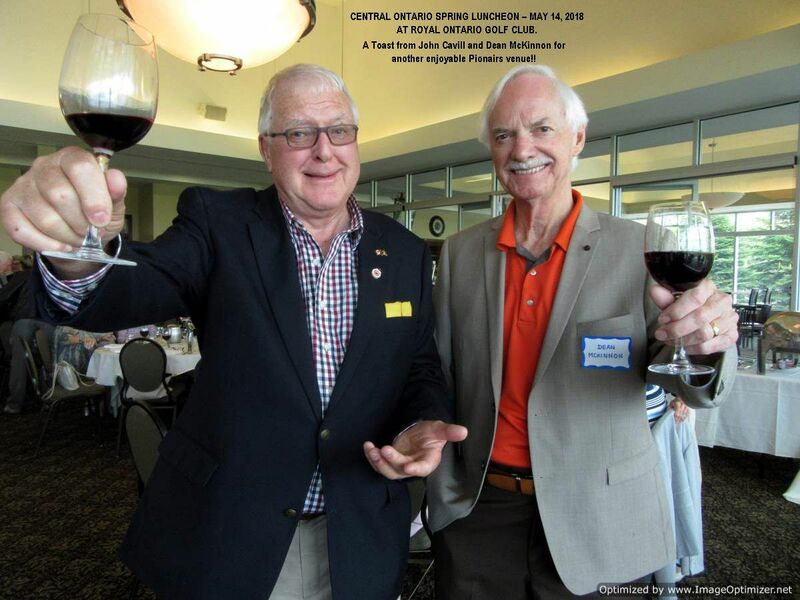 Central Ontario Treasurer, Ed Storrie (left), is finally taking his well-deserved retirement. 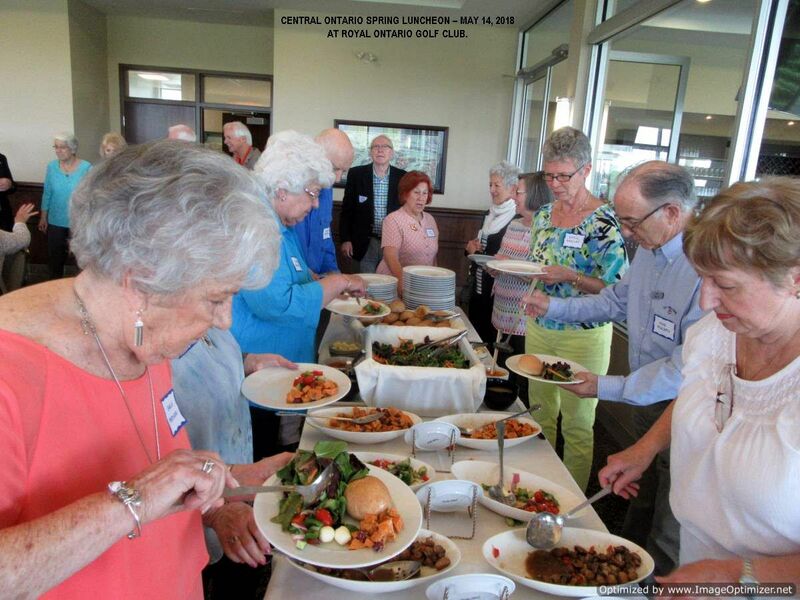 Ed served for many continuous years of outstanding and unwavering service to Pionairs in a multitude of capacities, encompassing both National and Central Ontario. 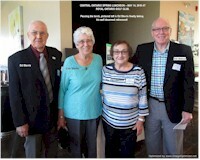 Shown here with his wife Lois Storrie, also a strong supporter of all Pionair endeavours. Next to Lois is Flo Christjanson, widow of Irv Christjanson who also served on the Board. On the right is Bob Newson, the incoming Treasurer, who is already serving on the Board as the Central Ontario Membership Director. This means Bob will be doing double-duty until a replacement comes forward. 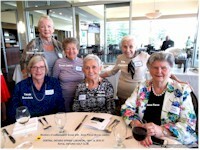 Members of Ladies Lunch Group: Traude Brunskole, Linda Holmes-Tennant, Susan Lawrie, Sylvia Hanson, Rita Champoux, and Anne Pierce (Group Leader). 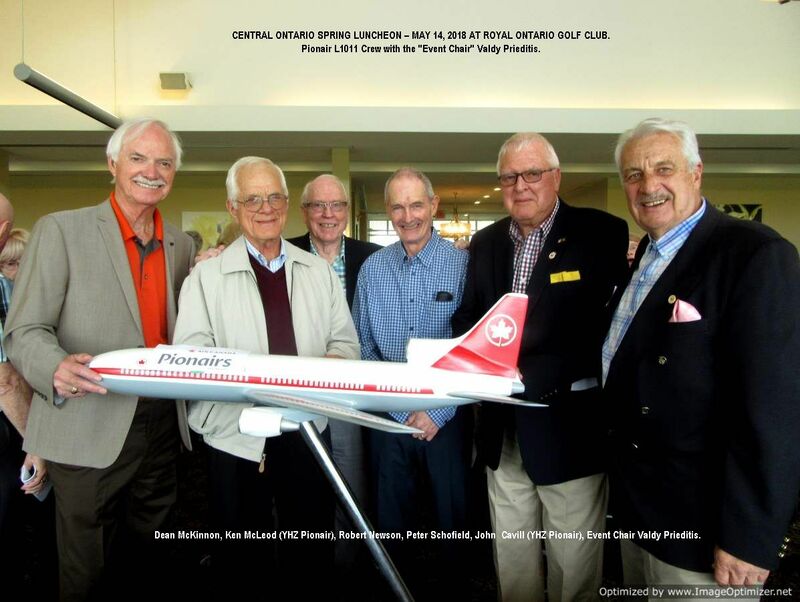 Pionair L1011 Crew: Dean McKinnon, Ken McLeod (YHZ Pionair), Robert Newson, Peter Schofield, John Cavill (YHZ Pionair) and Event Chair Valdy Prieditis. It was special and great to have a couple of ex YYZ’ers fly in for our luncheon. Finally, a toast from John Cavill and Dean McKinnon for another enjoyable Pionairs venue!! See the spread you missed! Be there next year. Delectable items on the sumptuous Buffet. In closing, feedback gave this year’s luncheon a “thumbs-up” with special kudos going to Chef Matt Woods and his staff who outdid themselves with a fabulous dessert table. 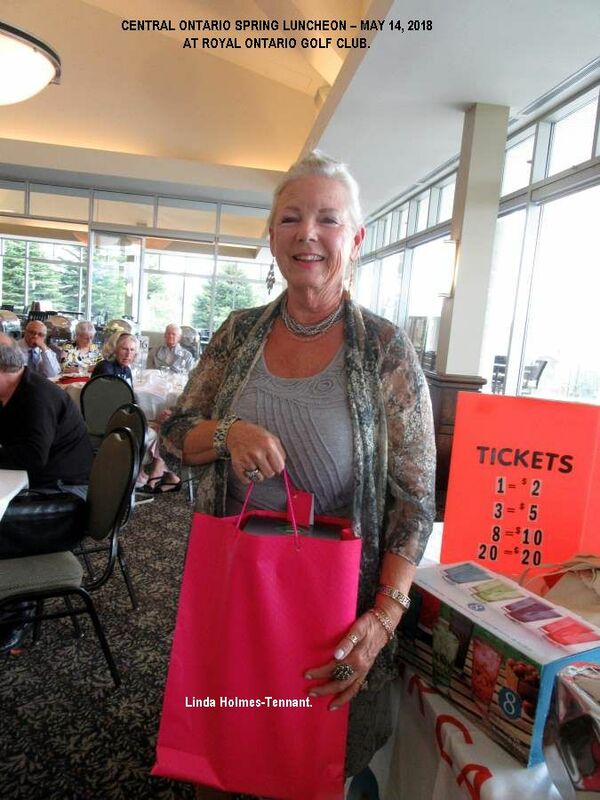 Royal Ontario Golf Club seems to be the leading contender and favourite for next year’s luncheon. The Montreal-Brussels route was inaugurated in April 1958 and discontinued in 1962. Then in 1969 and 1977, before the station again became an off-line office. Extracted from the "Horizons” magazine issue dated August 1983. 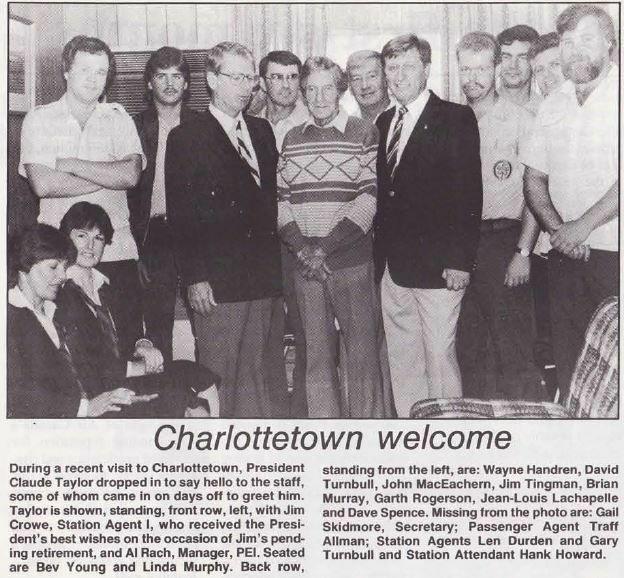 During a recent visit to Charlottetown, President Claude Taylor dropped in to say hello to the staff, some of whom came in on days off to greet him. 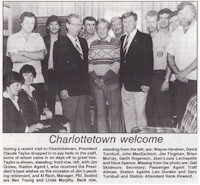 Taylor is shown, standing, front row, left, with Jim Crowe, Station Agent l, who received the President's best wishes on the occasion of his pending retirement, and Al Rach, Manager, PEl. Seated are Bev Young and Linda Murphy. Back row standing from the left, are Wayne Handren, David Turnbull, John MacEachern, Jim Tingman, Brian Murray, Garth Rogerson, Jean-Louis Lachapelle and Dave Spence. Missing from the photo, (someone has to run the show! 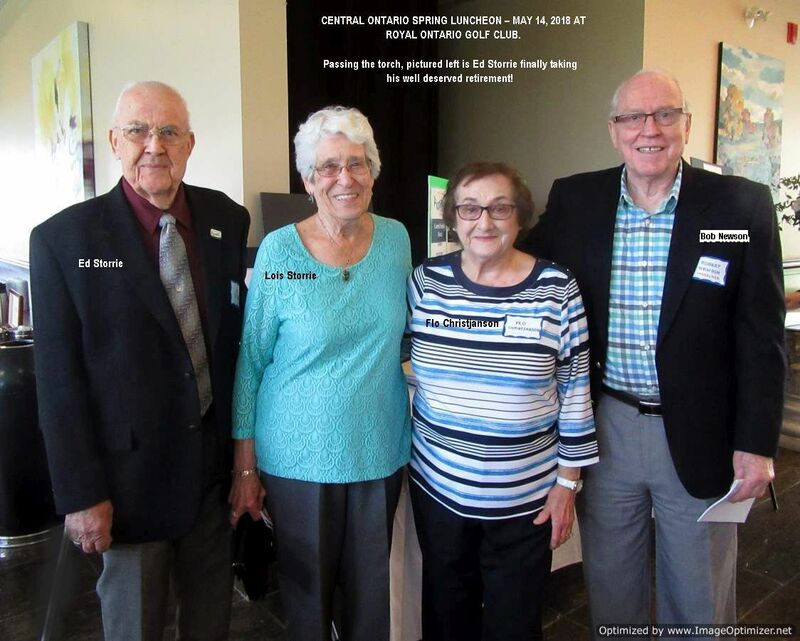 – eds) are Gail Skidmore, Secretary; Passenger Agent Traff Allman; Station Agents Len Durden and Gary Turnbull and Station Attendant Hank Howard. 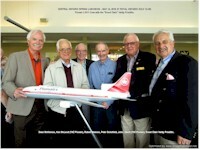 "Air Canada" went home in style on July 25 - courtesy of the airline after which it was named. "Air Canada" is a two-year-old English racing pigeon that somehow got off-course on a Penzance to Manchester race and ended up in Thunder Bay, Ontario. In gratitude to the company for flying the bird home, its owner. Jack Roberts of Marple, Cheshire, named the pigeon "Air Canada". 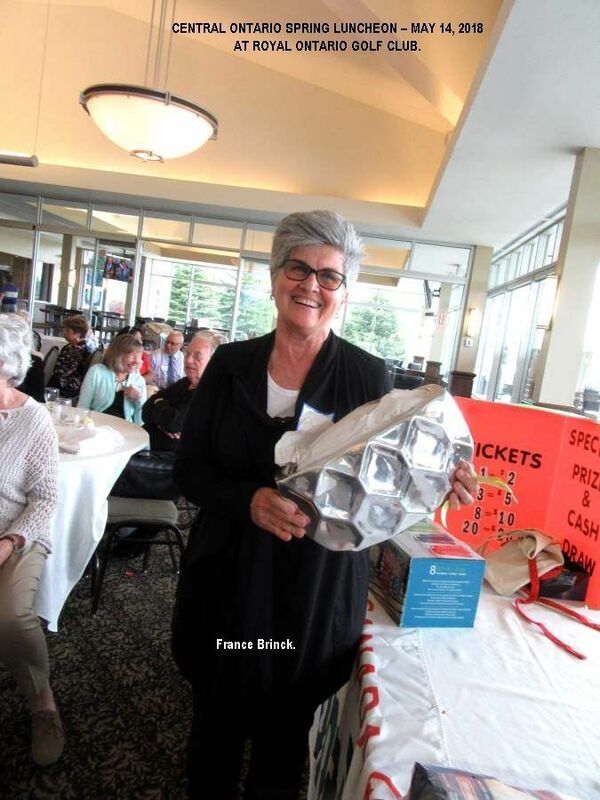 The story began when Thunder Bay resident Bob Balina found the weary and hungry creature in the area of the community's lakeside grain elevators on June 27 - 16 days after the pigeon set-off from Penzance with eight, feathered friends. "Air Canada's" homeward bound routing took him from Thunder Bay to Toronto and, after a short stop, onward to London, England on AC856. On the Thunder Bay - Toronto leg, "Air Canada" rode the flight deck with B-727 Captain Art Gillard; and en route to London, Captain Pat Palmer arranged for the bird to be placed in a cabin all to itself - because of passenger load, the B-747 upper deck seating was not in use. In this photo, we have Captain Art Gillard with a bird in the hand, and Passenger Agent Anna MacGallum to meet the press in Toronto. 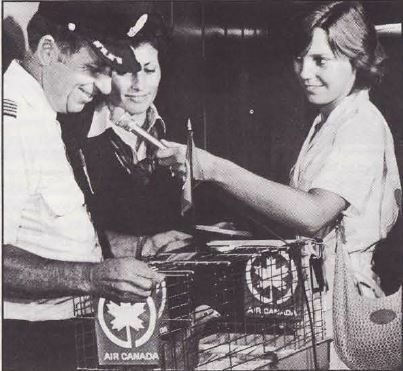 During the stopover en route from Thunder Bay to London, the bird, named "Air Canada" by its owner, was under the wing of Anna and Passenger Agent Erika Cravero who watched over it in the Maple Leaf lounge until boarding time for flight 856. On January 12, 2010, a severe earthquake devastated the Caribbean nation of Haiti, causing over 100,000 deaths, unfathomable destruction, and incalculable suffering. Almost immediately, Air Canada employees stepped up to offer their ideas, their money, even their time, to assist those in need. One of our first actions was to carry supplies to Port-au-Prince. On Saturday, January 16 at 7 a.m., AC2050 departed Montreal headquarters base for Port-au-Prince, Haiti. Air Canada employees worked round the clock to prepare the Boeing 767-300ER aircraft for the relief flight. The aircraft departed with 18,000 kilos of relief supplies including food, water, tents and medicine, and returned late that night carrying 112 weary but relieved evacuees home to Canada, along with four search and rescue volunteers. 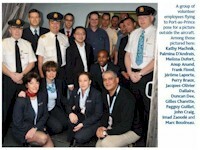 Below, a group of volunteer employees flying to Port-au-Prince pose for a picture outside the aircraft. 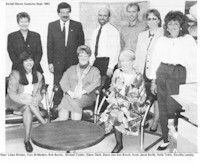 Kathy Machnik, Palmina D’Andreis, Melissa Dufort, Anup Anand, Frank Flood, Jérôme Laporte, Perry Braux, Jacques-Olivier Dallaire, Duncan Dee, Gilles Charette, Pagguy Guillet, John Craig, Imad Zaoudé and Marc Boudreau. 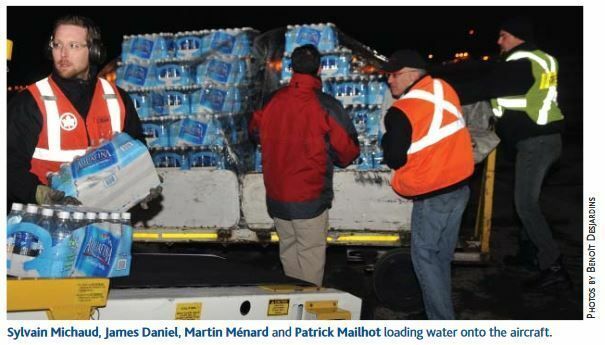 We have this photo of Sylvain Michaud, James Daniel, Martin Ménard and Patrick Mailhot loading water onto the aircraft. For the second consecutive year, Toronto-based Captain Bob Forrest had the pleasure of carrying the United Kingdom National Dairy Queen aboard his flight from London (LHR) to Toronto. The 1983 winner of the competition, mounted by the National Dairy Council, was 19 year old Alison de Feyter of Norfolk. She is shown in the cockpit of a 747 with Captain Bob Forrest and First Officer Jim Norwick. Air Canada had sponsored the competition since 1976. 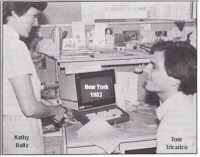 One step taken to assist New York reservations to become more sales effective was the installation of an Apollo and a Sabre terminal. The equipment allows Reservations Sales Agents, from the left, Suzanne Cummins, Angie Boyle and Alex Holub to provide Reservations with competitive input as well as to keep an eye on the display of Air Canada information in those co-host systems. Kathy Baltz, Reservations & Sales Office Manager, and Tom Tricarico, Reservations Agent regularly discuss and monitor the progress of sales effectiveness. From the "Parts and Pieces" magazine issue dated April 1993. 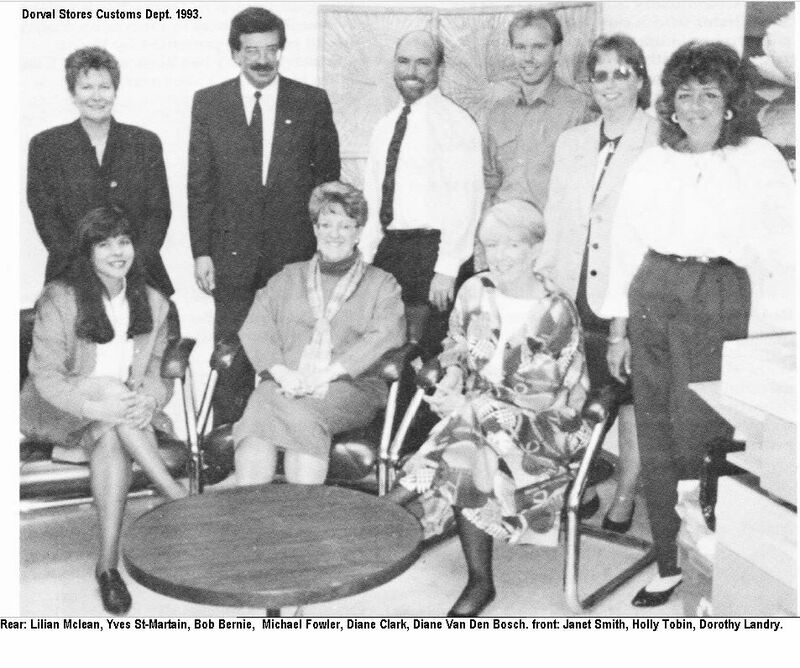 1992 was a tough year for the Dorval Stores Customs Department: We lost 30% of our staff in the cutbacks. The survivors have rallied and generally managed to provide competent, cheerful (?) service to hundreds of our customers. Back row: Lilian Mclean, Yves St-Martain, Bob Bernie, Michael Fowler, Diane Clark and Diane Van Den Bosch. Front row: Janet Smith, Holly Tobin and Dorothy Landry. As you hopefully noted above, we've lost a few more of our aviation "heroes." Although it's always sad to hear of their passing, they lived an exciting and interesting life and lived to a ripe old age. Rex Terpening wrote a book called "Bent Props and Blow Pots" in 2003 about his early career spent maintaining aircraft as an air engineer for Canadian Airways in the Northwest Territories. If you search the web for Rex or his book you will find lots of information to peruse. I haven't (yet) read the book but I do intend to. I spent a few very interesting months in the Arctic maintaining aircraft when I was only 23 years old, working for Nordair at the time (1973). So I think I'll be able to relate at least a little bit to what he talks about in his book. 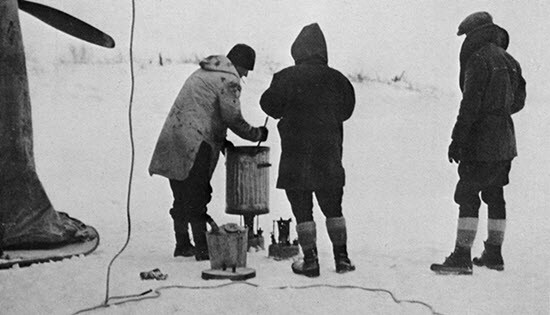 What Rex was talking about is "Blow Pots" which were used on aircraft in the artic on cold days to warm the engine oil. Because the temperatures could sometimes be as low as -40 F (or C) at times (or more) the oil in the engine turned to the thickness of molasses when cold. Blowpots, which were similar to propane burners used to heat large pots (think corn roast) were used to heat the oil so the engines could turn in order to start. They actually had to drain the oil every night, put the oil in a big can and heat it, then pour it back into the engine in the morning before leaving. See the photo below. What a pain! Can you imagine doing this with your car in YWG in the winter? With permission via Larry Milberry/CANAV Books. From the Leslie Corness collection. Besides frequent and ever-exciting visitors, Edmonton was home to dozens of ordinary bush planes that plied the Mackenzie River Valley down to the Arctic coast. The Curtiss Robin was a typical hard-working northern workhorse. CF-AHH was first registered in Canada in 1929. It served various Alberta owners into 1946, when it migrated to Hudson, Ontario to fly with Starratt Airways. The last heard of CF-AHH was that it was with an Air Cadet Squadron in Winnipeg in 1950. Leslie caught it in this ideal view heading out from Edmonton on skis (tail draggers tend to look especially nice in a 'rear 3/4' view). This is a typical shot by Leslie, where the day was cloudy. The result was nice even lighting with no harsh/distracting shadows. One of the truly delightful sources of information about any such early US-certified aircraft is the magnificent 9-volume set 'US Civil Aircraft Series' by the inimitable Joseph P. Juptner as fans everywhere have been leaning on Juptner for ‘the good gen' since his series first appeared in 1966. Any serious fan would appreciate this collection. Probably the best part about being involved with the NetLetter is the feedback and comments that we receive from our readers. Thanks to your input, every story we write seems to lead to another story. Our friend, Ken Pickford, who helps us with each NetLetter issue by volunteering his proof reading skills, sent in the following regarding the “aircraft restaurant” in Terry’s Trivia article from NL #1395. “The aircraft type is a YS-11, built by a consortium of major Japanese companies, a 60-seat twin-turboprop powered by two Rolls-Royce Darts, 182 built through 1974. In service 1965. Winnipeg-based Transair operated 2 factory-delivered YS-11’s from 1966 until Transair's acquisition by Pacific Western Airlines in 1979. Transair probably got a good deal on those aircraft. Sizable US regional carrier Piedmont Airlines (which merged with US Air in 1989) was the largest export customer with 20 plus a few acquired used. They used them on their short haul network along the east coast for a decade or more until the early 1980s. "Among the employees at Transair’s Churchill base the year the YS-11 entered service was a young ticket agent named Peter Mansbridge. Instead of purchasing B-737s (three of which were acquired later), Transair purchased two YS-11 turboprops in 1968. These replaced the company’s aging DC-4s and could be flown into small northern airports in a mixed passenger/cargo configuration. The YS-11s would remain in Transair’s fleet until 1979." I had written about Transair in NL #1352 but neglected to mention these two aircraft built by the Nihon Aircraft Manufacturing Corporation. Registrations CF-TAK (pictured) and CF-TAM would finish their careers as N110PH and N111PH flying for Mid Pacific Air of Hawaii. Mid Pacific Air ceased passenger operations in 1988 but continued cargo operations until 1995. Unfortunately, the fate of these two aircraft seems to be unknown. Special thanks to Gary Vincent for permission to use this rare photograph of one of the two Transair YS-11's. 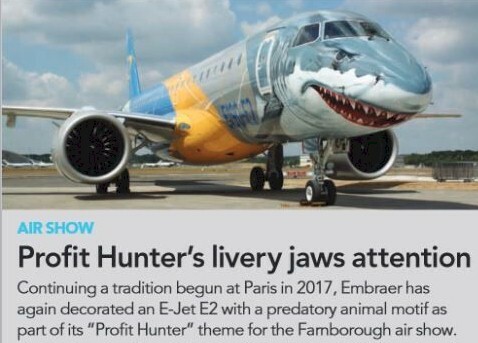 Here we have the latest paint job which Embraer has decorated an E-Jet-E2 with a predatory animal motif as part of its "Profit Hunter" theme for the 2018 Farnborough air show. 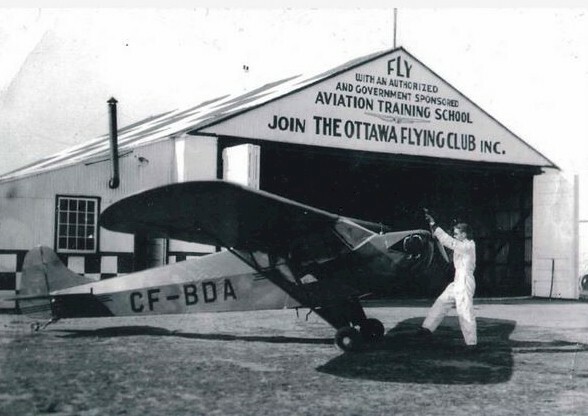 The Ottawa Flying Club – eastern Canada’s oldest flying club – has been in continuous operation since 1928 and represents a history of aviation accomplishment and an ongoing romance with flight. From the early days when a group of aviators – dressed in goggles, leather helmets and boots – met at the sand flats beside the scenic Rideau River on a grassy field identified only with a solitary windsock, the Club has come to symbolize the ongoing romance with flight. Located at Ottawa MacDonald Cartier International Airport. Executives from Air Transat say the company's rapid European summer expansion is part of a long-term strategy to remain competitive in transatlantic markets. Air Canada acknowledges that the weather at St. John's, Newfoundland is probably worse than anywhere else on the system. Sometimes, your airplanes don't get in. Ace McCool's airplanes always get in! McCool is President, CEO and Chief Pilot of Down East International Airlines, based at Moncton, New Brunswick, where the weather is no great shakes, either. But what sets DEI apart from other airlines is that it doesn't exist - except in Air Canada Captain Jack Desmarais' imagination and the back page of Canadian Aviation, Canada's National Aviation Magazine. And, not only are there DEI and McCool, there is Pete Braddock, T.l. (for Totally Inept) Jacobs, The Smarts, Cowboy McCloskey, Red Starr and Churchy Laflamme, "de bes' co-pilot of dem all." Stew Jane is a flight engineer, Mile-High Millie and Crazy lris take care of things in the cabin, and Phil Lister keeps the airplanes mechanically fit. That's "The Squadron" and it has become something of a legend since the McCool stories began in 1971. And we think you would enjoy reading about how not to operate a responsible airline. "Ace McCool The hilarious collection from Down East International" by Jack Desmarais. available from Amazon. Terry Baker, co-founder of the NetLetter scours the internet for aviation-related Trivia and Travel Tips for you, our readers, to peruse. In 1919 Eddie Hubbard was the first pilot to land in Victoria’s harbour. Under contract with the United States Postal Service (USPS), he established the first airmail service on the west coast flying into Victoria’s harbour out of Seattle. In his two years, he flew 35,000 miles over 220 Seattle – Victoria round trips. In 1921 for no discernable reason, Hubbard lost the USPS contract to Alaska Airways. Ancel Eckmann who, in 1929, would be the first to fly Seattle-Juneau, flew American Airways’ Curtiss HS-21 flying boat on the service. The contract reverted back to Hubbard six months later. Upon Hubbard’s retirement in 1927, Herold Walker took over from Hubbard. He flew Hubbard’s B1 flying boat for Northwest Air Services Inc. until 1929. The Farnborough International Airshow is a week-long, biennial event that combines a major trade exhibition for the aerospace and defence industries with a public airshow. This year's event was held July 16 to 19, 2018 at Farnborough Airport in Hampshire, United Kingdom. 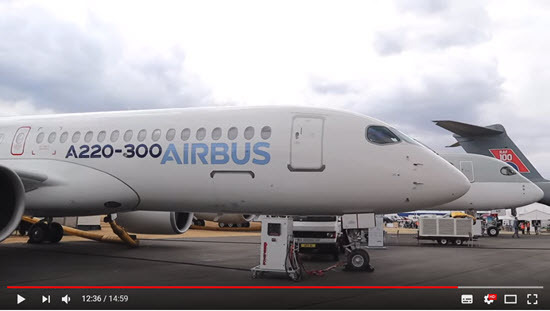 Below is a Youtube video showing "The BEST of Farnborough Airshow 2018". Sent to us by Bob Coates. A Boeing 777 jetliner was lumbering along at 800km/hour at 33000 feet when a cocky F-16 fighter jet flashed by at Mach 2. He promptly went into a barrel roll, followed by a steep, unimaginable, vertical climb. He then finished with a sonic boom as he broke the sound barrier, then screamed down at impossible G’s before levelling at almost sea level. The F-16 pilot asked the 777 pilot what he thought of that? The 777 pilot chuckled and said, "I stood up, stretched my legs, walked to the back, used the toilet, then got a cup of coffee and a cinnamon roll and secured a date for the next 3 nights in a five-star hotel paid for by the company." When you are young and foolish, speed and flash may seem like a good thing! When you get older and smarter, comfort and dullness is not such a bad thing! It's called S.O.S. - Slower, Older, Smarter! Dedicated to all my friends approaching, or who have already achieved, S.O.S...."Don't take life too seriously".